Of course, I don't normally have Playstation games on my animation blog, but here - since this extra is not really a game, and you are just watching computer-generated figures in an animation - I feel justified. 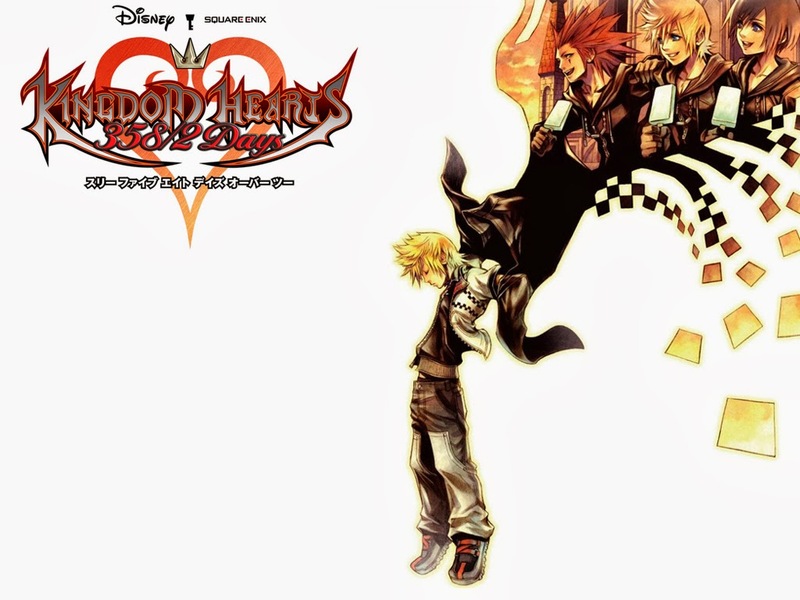 Of all the Kingdom Hearts games, 358/2 Days was my least favourite - yes, even including Re:Coded. An overlong game of the same thing over and over, with exceptionally easy hidden bosses, an irritating angst-fest of a story, characters I have never liked and one of those horribly annoying boss fights where you win, then in the cutscene afterwards you are immediately overpowered, making you wonder why you had to do the fight in the first place. But the HD remix was quite a different prospect. For one thing, it was the most dramatically-improved game graphically in this HD set - though the cutscenes in the original game looked impressive for the DS, that's still quite a significant qualifier. For another, with all-new voice acting, it was the part of the project that had the most new experiences attached. And honestly, not having to play through the whole damn game again - possibly even several times if they kept the same trophy structure - was a blessing. My original plan was to play this after Re:Chain of Memories, or perhaps to watch the cutscenes up to the point when the Organization members depart for Castle Oblivion and then play the game, returning for the rest of the cutscenes afterwards - probably the best chronology of the remastered trilogy - but then I discovered that there are cards I'm not going to get in CoM if I don't get through 358/2 Days first, so I prioritised this. My feelings haven't changed, exactly, but I felt a lot more charitable towards the characters and the game as a whole after experiencing the story a second time. Remove the frustrating player experience and one headache is taken away, which is a major plus point, but I also have a somewhat better understanding of the idea of Nobodies in the series - when I played, I thought the hints in this direction were just the characters being misled, where by now we have learnt that in fact, the central characters' proximity to the 'hero' actually has made them recover some aspect of a heart. I was annoyed before that Nobodies had been established as a kind of heartless, incapable of true feelings, and thus the variety of feelings on display here were illusory - which is no longer a possibility. Of course, this brings about a variety of complex implications to Sora's moral path, centred on the fact that he could have subdued and rehabilitated all but the most evil of the Nobodies and through just being near them returned them to a kind of humanity, and though he could not have known this, it will feel like a horrible oversight to me that he will likely never realise and come to feel deep remorse. This is a story conceived entirely to be tragic - to build something pleasant to revel in tearing it down. Roxas, whose fate we already know when we begin the game, is already a miserable enough character even before the development of the Riku Replica storyline leads to Xion. The set-up has Roxas and Xion unable to coexist indefinitely, each causing the other misery - at first through insecurity as they don't understand the effect each has on the other, and then later through a pointless struggle against inevitable loss. The fact that the focus then shifts to the fact that they begin as friends - and the added factor of the necessity for Xion to be entirely forgotten for the plot to continue - results in the most angst-ridden of all Square Enix's recent angst-a-thons, to the order of The World Ends With You cubed. Yet, partly because I now know they are indeed supposed to have developed genuine humanity rather than merely acting according to memories of genuine feelings - which was the set-up - I liked all the characters more this time. I still dislike Axel and first and foremost will remember his smug, swaggering character in Chain of Memories and, indeed, Kingdom Hearts II, but his helplessness towards the end here is actually quite appealing, and the glimpses beneath the facade his diary entries afford show there is some depth to him - overlaid, at least, on what has been established prior to this game. His actions throughout the series remain the result of his stunted, selfish personality, and I don't look forward to how Kingdom Hearts 3 will portray the restored Lea (especially in relation to Ventus, who I really don't want to become a Roxas substitute), but when his plans finally go awry and he is adrift and helpless, I could begin to sympathise with him. With Xion, her imposition on the storyline still rankles somewhat, but she is a victim - one of the purest victims any video game I've played focuses on - and ultimately a plaything of cruel men, and I found myself feeling more protective than before. I prefer this voice actress than when Kairi's steps in, and the insubstantial quality to her feeble struggle is quite moving. I also noticed that the HD version seems to highlight her facial similarities to Sora more than to Kairi, which changes the dynamic very slightly, reminding me more immediately of the impossibility of her sustaining any kind of existence. Then there's Roxas. Roxas, who I didn't want to have to deal with at all in Kingdom Hearts II, and less still here. I have never liked Roxas - making it perhaps bizarre that I love his doppelganger Ventus so much and would consider his showing up here to reflect Braig's odd obsession with one rather unremarkable moment in what is still one of the series' best moments of foreshadowing the highlight of this whole experience. But Roxas doesn't have as much of an attitude problem here as I recall him having - and perhaps I find the adolescent outbursts more ridiculous (and therefore cute) than before, like when he bothers to get his diary out to break off into a one-line all-caps mini-rant about how he won't put up with this treatment. It is also probably the game where Riku is the most tolerable, as a harsh yet dependable sounding-board for Xion despite their conflicts (and another adorably adolescent diary entry, from her this time). He is in a place of repentance, here, but also put into a mentor position, authoritative, standoffish and ultimately self-sacrificing - it makes a big difference from the rash brat of the first game. Ultimately, I still think that Organization XIII was a huge mistake for the writers of the series, especially how they have dominated every game since Chain of Memories except Birth by Sleep. In DDD we discover that the whole thing was a sham anyway. As characters, they are not a compelling bunch - I find only Xigbar to be enjoyable (and Braig, who is very much the same) - the idea of them completing and then using a recreated Kingdom Hearts never feels like enough of a threat for game 2 (especially in light of Master Xehanort eventually declaring them all failures and making a new Organization XIII out of various versions of himself) and the more they are developed, the worse it is for the character of Sora - who becomes an unfeeling psychopathic butcher if you make the characters too human...though of course it has since in one of the worst plot-wriggles of the series been revealed that defeating Nobodies and the heartless formed when they were created somehow brings Somebodies back to life...as opposed to the hearts going to Xemnas' Kingdom Hearts like everyone else's. For all the convolution, this is a period of time the series needed to cover in some form - from Roxas' inception to his being captured and digitised by DiZ - and the sheer unrelenting tragedy is probably appropriate. The trouble is that it just seems so juvenile...in a way that, perhaps paradoxically, the cheerful adventures of Sora through Disney worlds does not. I luv kindom herts roxas is the best. But I luv u moar for this comment. As much as I disliked 358/2 days due to its tearfully boring game play I suppose I would give the HD remix another shot as I like the remastered cut scenes and would like to stalk Riku and find out what he was up to during Sora's slumber. On the other hand I really don't want to be apart of Roxas and Xion's angst-y teenage adventures. Ahh, well, I'm afraid this - like The World Ends With You - is teen angst the video game. Riku is damn angsty, too, though less annoying about it than Roxas. And while also angsty, Xion seems slightly more justified in it because she's just - figuratively - dumped on for her entire existence. Yes, I remember viewing a few of the DS Cutscenes on Youtube a few years back and Xion struck me as just- "used". However I DO like her theme music so I guess that's nice to listen to during the play through.